Home Sales Tax Updates Waybills Andhrapradesh CST E- Waybills Generated Rules Effective From 15th of August 2015. Andhrapradesh CST E- Waybills Generated Rules Effective From 15th of August 2015. SUB: Certain commodities not figured in the CST registrations – Online CST e-way bills not generated- Certain representations received from business associations- Time allowed to add the commodities by the dealers–Registering authorities requested to add commodities as and when request received-Certain instructions issued –Reg. All the Deputy Commissioners(CT) are here by directed to issue necessary instructions to the dealers regarding e-way bills and e- c-forms and ensure that the following instructions are followed by them. It has been decided that CST e- Way bills will be allowed to be generated by the dealers only if the commodity is registered by the dealer. Also to generate way bills for sensitive commodities the dealer should have registered these commodities in the registration. Also use of manual way bills for sensitive commodities is prohibited unless the sensitive commodity is registered by the dealer. A dealer can register 3 sensitive commodities. This provision will be effective from 15th of August. 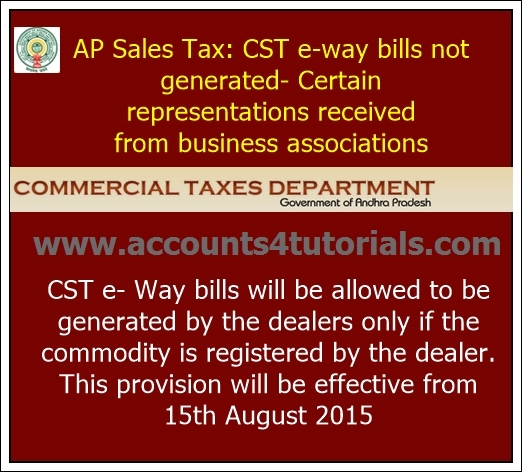 Hence all the dealers are requested to complete the registration of commodities by 14th of August, 2015 failing which they will not be able to generate CST e- Way Bills and also VAT e- Way Bills.